Just a short 20 minute drive outside of Halifax this spectacular and unique home is surrounded by the most astonishingly beautiful scenery where the coastal barrens give way to rugged granite cliffs, pounded by the Atlantic surf. 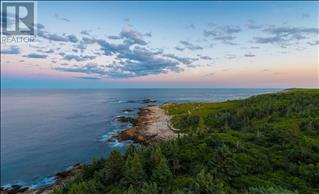 Overlooking the Atlantic, this Â‘one of a kindÂ’ contemporary residence is located on a private 2.7 acre estate that includes 550 ft of rugged oceanfront bordering 1800 acres of pristine Crown Land. 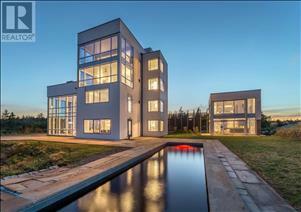 This modern 6,790 sq ft masterpiece of concrete, steel, stone and glass offers breathtaking 360 degree views and was once a WWII observation tower strategically positioned to guard the coast and Halifax Harbour. 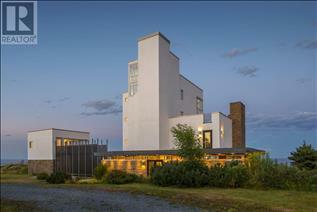 Renowned designer Erla Laurie came upon the abandoned military installation and was inspired to make it her home. This iconic residence includes a main level open concept floor plan designed with entertaining in mind. The great room with its 20Â’ walls of glass and soaring ceiling is the main focal point of the main level and provides access to the outdoor terraces and the enchanting, Â‘ocean viewÂ’ infinity pool. The dining room with its feature, marble wall and is perfect for more formal occasions, while the beautiful cherry wood and soapstone kitchen offers a more relaxed gathering space for friends and family around the oversized eat-in island. The main house includes a wonderful open, library/office area on the second floor and 3 bedrooms, including the sumptuous master suite with luxury spa ensuite, wet bar and private roof top deck with hot tub and wood burning fireplace. There are 2 more equally beautiful guest suites with ensuite bathrooms and a commercial elevator that links all the levels to the top floor roof deck. Accessible from the main house via walkways on 2 levels a separate, 2 storey guest house provides visitors with their own private space and has a fully equipped kitchen, sitting area and bedroom with ensuite.